I've always admired the guys at Winternals because they really know their stuff. They have come out with a number of products over the years that have helped me tremendously. This piece of software, though, seems to deviate from that pattern. Defrag Commander turns out to be little more than an add-on to the built-in Win2K defragmenter that Microsoft provides. Defrag Commander is faster and provides a few more features, but not as many as other products. When you run the software you'll notice an icon in the left pane labeled Defrag Commander PE andone labeled Disk Defragmenter. The first icon will display a listing of drives that you can analyze and defragment. If you click on the second icon you'll be presented with a screen that looks almost exactly like the built-in defragmenter from Microsoft. If you right-click a disk and select defragment, the process that begins looks exactly the same as the Microsoft tool as well. This process is faster and more thorough than the built-in tool and it seems to consolidate free space. Figure 1 shows Defrag Commander in action. Defrag Commander also allows you to schedule defragmentation, whereas the built-in tool does not. If you select the Defrag Commander PE icon and right-click a disk in the right pane you'll be given the option to schedule defragmentation. This can be done at low or high priority, and at any time of the day. Be careful though: I could not find a way to remove a schedule except by having it expire. 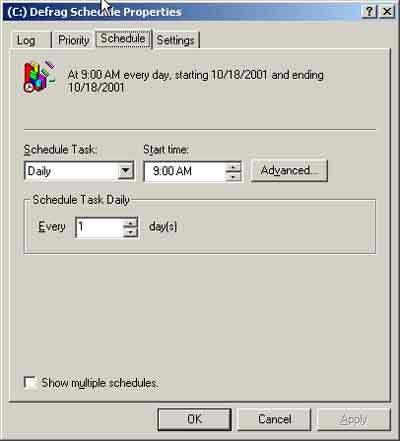 Figure 2 shows the task-scheduling interface. Figure 2. Defrag Commander lets you schedule one-time or periodic defragmentation for your drives. Because the system files are always open, they cannot be optimized while the system is running. For this reason, most other defragmentation tools offer you the capability to perform an offline defragmentation of the system files. Not here; the only way to defragment the paging file is to download a piece of freeware from Winternals called PageDefrag, and even then you cannot defragment the numerous other system files that require optimization. If you're just a home user without a lot of money this may be a viable piece of software for you since it does run on Windows 2000/NT/98/ME. But if you're a serious user who wants a fast system, you should consider other options.